Tillerson will become the fourth senior U.S. official to visit New Delhi after the Trump Administration took over. 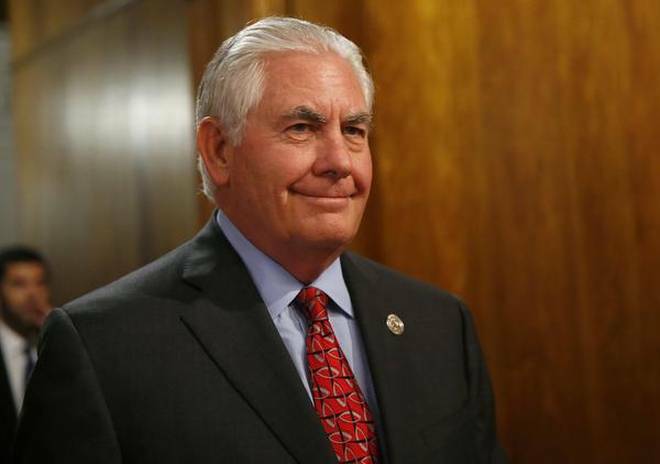 U.S. Secretary of State Rex Tillerson is expected to visit India “later in October”, officials in New Delhi and Washington confirmed to The Hindu. The modalities of the visit and the dates are still being discussed. Mr. Tillerson will become the fourth senior U.S. official to visit New Delhi after the Trump Administration took over. National Security Advisor H.R. McMaster arrived in April, Alice Wells, Washington’s top official for South and Central Asia, in July, and Defence Secretary James Mattis in September. Significantly, as Mr. McMaster and Ms. Wells, Mr. Tillerson is expected to travel to both India and Pakistan on the same visit, indicating a sharp shift from precedent. During the Bush and Obama administrations, U.S. officials had avoided clubbing visits to New Delhi and Islamabad because of India’s sensitivities over a “hyphenation” of the U.S.’s relations with India and Pakistan. The U.S. Secretary of State’s visit to India is likely to highlight growing ties between New Delhi and Washington, and growing cooperation between them on Afghanistan. This follows President Trump’s announcement of his new South Asia policy, which has encouraged India to invest more in development projects in Afghanistan, while taking a much tougher line on Pakistan’s support to terror groups. “We need to try one more time to make this strategy work with them … and if our best efforts fail, the President is prepared to take whatever steps are necessary,” Mr. Mattis, who is expected to visit Pakistan close on the heels of Mr. Tillerson, said at a House Armed Services Committee hearing on October 3. Among steps the U.S. is believed to be considering against Pakistan is the cancellation of its Non-NATO ally status, further cuts to military and civilian aid to Pakistan, as well as targeted sanctions against officials believed to have links with terror groups. However, while India has welcomed the U.S.’s avowed hard line on Islamabad, many may look askance at the newly revived policy of senior officials visiting both India and Pakistan on the same trip, which in the past gave the appearance of the U.S. “mediating” between the two countries. Statements earlier this year by U.S. envoy to the UN suggesting that Washington was prepared to mediate to “de-escalate the India-Pakistan conflict”, as well as Mr. Tillerson’s suggestion that “India take some steps of rapprochement on issues with Pakistan” — in a reference to Kashmir — have added to the disquiet. The Trump administration’s decision to merge the Af-Pak. desk (office of the Special Representative on Afghanistan and Pakistan) with that handling Central and South Asia has also been seen as another step towards rehyphenating India and Pakistan with a view to handling South Asia. “In the context of Afghanistan, this may end up becoming a (India-Pakistan) hyphenation,” said India’s former Ambassador to the U.S. Arun Singh, who had earlier managed the Pakistan-Afghanistan desk. “However, U.S. relations with the two countries have advanced in different directions. The U.S. is now focussed on Afghanistan and perhaps containing nuclear proliferation. Relations with India are much wider, so it is not possible to hyphenate India and Pakistan the same way as before,” Mr. Singh added.